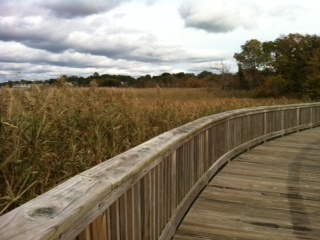 There is something special about walking on a wetland boardwalk. Maybe it’s the feel of wood decking instead of concrete or maybe it’s just the feeling of being able to enter into an entire world otherwise completely inaccessible without galoshes or thigh high gators. I recently paid a visit to the Audubon Environmental Education Center in Bristol. Situated on 28 acres, the wildlife refuge boast walking trails, a connection to the East Bay Bike path and ¼ mile of boardwalk. The walk from the education center to the trail end at Narragansett Bay is only a short 3/4 of a mile, but for such a small distance the varying habitats you cross through is impressive. Entering at the orchard and butterfly gardens you walk until the path crosses the East Bay bike path where the boardwalk begins, curving through the forest. In the marsh you are completely surrounded by walls of Phragmites until your view dramatically opens up as the walk comes to its conclusion at Narragansett Bay. With the use of low impact technologies combined with an overall new-found respect for wetlands and the role they play in our lives, boardwalks such as these have been popping up across the country in municipal, educational and private capacities. 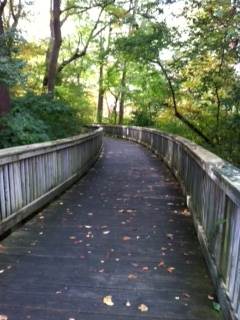 Recently a remarkable 2,700 foot long boardwalk was constructed at a residence in the Berkshires. Conceived by Reed Hilderbrand Associates, Inc., the project was designed through months of integrated ecological study and was constructed completely by hand, making it a spectacular example of what inspired design and environmental restoration can be.Today coastal and wetland restoration is not just a goal but a requirement, and its projects such as these that provide us with rare intimate access that allow us to truly celebrate both the function and dynamic beauty of these natural resources.